I realize I am not a very good blogger these days, I'm going to try and be better. Its been over two months since my last post! Life is going great for us. We survived the holidays and loved all the time we got to spend with our wonderful families. There is something about Thanksgiving and Christmas that I just love. It is such a great time to celebrate the birth of our Savior and realize how blessed we are. Since I last posted Jonny has been hard at work. He took his real estate test and passed on the first time. This was a big milestone for him- he's been talking about getting his license since I first met him. I was so proud of him for accomplishing this long time goal. And last week he closed on his first house! He was so excited and it was awesome to see all of his hard work paying off. He's also still doing the alarm systems as well. He's such a hard worker and I'm so lucky to have him! I've been looking for a job since we moved back in October.... yes I said OCTOBER! I have never had this hard of a time getting a job. I guess its a sign of the economy and the overwhelming amount of hygienists in Utah. Thanks to a friend I have been able to get a job for Mondays. I'm so grateful for it :) Its at an awesome office in Provo and so far I have loved working there. So I'm just crossing my fingers to find a job for the rest of the days. Even though I haven't been working much I still find things to do with my time. We finally finished painting and fixing up the house, which feels great. But the housework never ends. I always find myself thinking, really do we have this much laundry? I just did it and yet its piled up again! And we don't even have kids yet. But, I am grateful for it. I'm grateful for all the blessings we have! My parents came and stayed at our house over Thanksgiving. It was so fun to have them here and to be able to have them stay in our house with us. Two of my brothers live in Farmington so they were also around. We had a great time. We got together with old friends, saw some family, went to Grandma Boyle's grave, played games and watched movies. 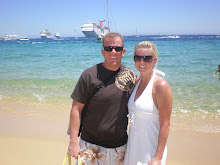 Here is Mom and Dad sporting their BYU shirts ( they met at BYU, awww) . Go Cougars! My Mom with her sisters, Rita and Rochele. They are a riot when they get together. We always laugh and have such a good time. Don't they look alike? Here are some of the cousins that were also in Utah. We went to temple square and looked at the Christmas lights. We always look forward to the backend party for Pinnacle. They have great food and celebrate the success over the year. Jonny had a great summer working with them and ended up being 9th in the whole company. He worked so hard all summer so it was good to see him being recognized for all that work. He he was getting an award on stage. He won some great prizes and got a nice plaque (below). Jonny surprised me with a new MAC computer. I LOVE it. I was so surprised too! It was a great birthday and I have the best husband for making it so special. Here is Cubby on Christmas Even in his PJ's. I thought they were so cute, even though Jonny thought they were silly and that I'm crazy for dressing my dog! In our matching PJ's that my parents get us every year. This was our first Christmas in our house and first time having our own tree. I loved it! Jonny on Christmas morning playing with his new golf clubs. Jonny was in Las Vegas for work. So on Thursday night I flew down there and spent the weekend with him and drove home with him. It was a fun little vacation. I pretty much hung out in the hotel by myself during the day when he was working. But we had a lot of fun at night. 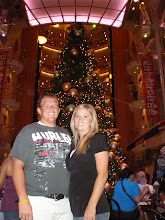 We walked around the strip, ate at a buffet, and saw Mystere. It was the most amazing show ever! 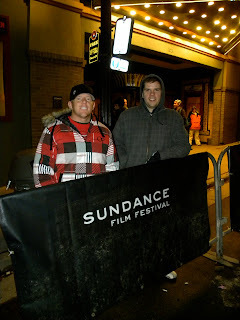 Last weekend Jonny, Cameron, and I went up to the film festival. We weren't there too long, just enough to have some dinner and walk around a bit. We didn't see anyone famous :( I'm not sure of where the hot spots are to go! Next time we'll plan a little better and try and see a show or something. But it was still a lot of fun!